Retrieve your clips from the cloud. Quickly find the clip you want. Paste it into any text box in any application. Add new clips in your cloud database. Manage projects and team members. 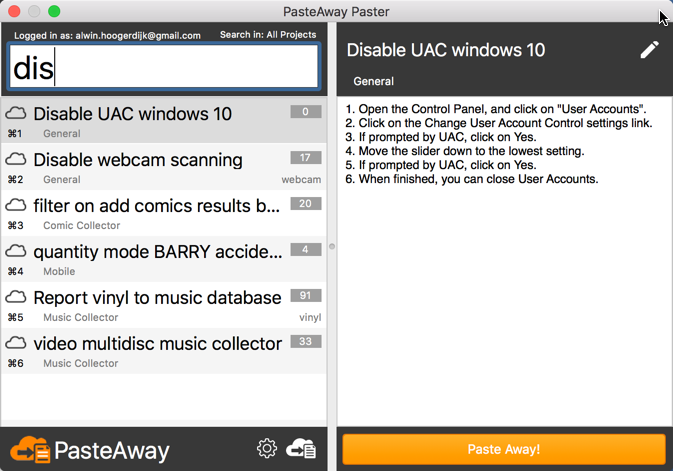 The PasteAway Paster is a client app that lets you easily paste clips from your online repository into any application. To use a clip, pop-up the Paster (using a keyboard shortcut you select), pick a clip and hit enter to paste it. Find clips quickly by searching your clip database by clip Key, Name or Tags. Make your life easier by only showing the clips for the project you're currently working on. Create new clips in your online clip repository by promoting captured local clips to the cloud. Add new clips to your repository and modify existing ones. Changes and additions are instantly available in your Paster app. Quickly find specific clips in your Paster by assigning quick access keys that are unique within your clip list. Set one or more tags for each clip, to group them into categories and to help with searches. Create multiple project teams with their own users and projects. Manage access to clips by grouping them into projects. Manage lots of response templates for common questions as clips in your PasteAway clipboard manager. 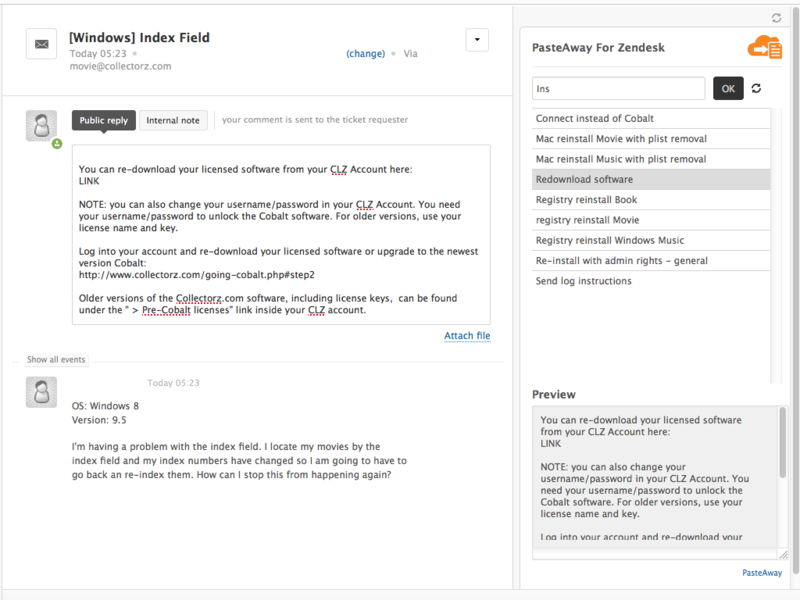 Easily make the response your write available for your entire help desk team or only for project members.